LRR CAUSE A STORM AT FRITTON! Lowestoft Road Runners were out in force at race 5 of the Suffolk Winter League Cross Country Series which took place at Fritton Lake on Sunday 10 March. Considered their ‘home’ event 41 members donned the blue and yellow to run a 2 lap course of just over 4 miles, battling their way through the elements. The course was a mixture of mud leaves and rain leaving the route boggy in places (but that’s what cross country is all about!). First home was Robert Chenery in 4th, closely followed by Carl Prewer in 9th and Tom Galley in 12th. For the ladies Louise Bernasconi was first home for the team in 88th overall followed by Katy Oldman (93rd) and Vicki Grice (108th). As well as those familiar to racing off-road there were also a few members giving cross country a go for the first time which was great to see and certainly bolstered the teams numbers and points. The club has picked up some great results during the season so far with some excellent individual results with both Robert Cheverton and Tracy Prewer sitting in 1st, Carl Prewer and Colleen Mukuya in 2nd and Louise Bernasconi in 3rd for their respective age categories. In the team standings, the Ladies A Team are currently 2nd overall and the Male and Combined A Teams in 4th. Other results from Fritton were as follows; Robert Chenery (4th), Carl Prewer (9th), Tom Galley (12th), Simon Cook (16th), John Jervis (20th), Martin Farr (30th), Robert Cheverton (36th), Leigh Butcher (37th), Neil Bye (59th), Scott Bruce (82nd), Karle Howard (83rd), Louise Bernasconi (88th), Shaun Lark (89th), Katy Oldman (93rd) Harrison Page (99th), Vicki Grice (108th), Tracy Prewer (114th), Ian Marshall (125th), Aaron Shrimpton (131st), Rachel Plant (132nd), Bernard Mukuya (151st), Flo Ashdown (154th), James Crisp (155th), Becky Lawler (160th), Cat Fletcher (166th), Shaun Kay (169th), Philip Ayers (172nd), Karen Evans (188th), Hung Lai (189th), Elayne Hilton (192nd), Caroline Peek (200th), Mark Elflett (203rd), Jo Bisset-Smith (206th), Steph Strowger (219th), Marie Ayers (221st), Jo Pallant (262nd), Debbie Secret (270th), Debbie Lovegrove (285th), Tracy Shrimpton (286th), Su Wilson (287th) and Darryl Ainslie (303rd). 15 members descended on Amsterdam to take on the marathon, half marathon or 8k race. The team said it was a fantastic weekend with the course achieving personal best results. The weather was good to them and finishing in the run inside Olympic stadium was amazing with great support & atmosphere around the course. They finished the weekend off by celebrating & seeing some of the city's iconic sites. Mid-week saw our very own Vicki Grice represent Great Britain in the Ibiza ETU Aquathlon Championships. Vicki was up against some very strong competition. She finished an incredible 7th Place & was 3rd Brit back which means she has now managed to pre-qualify for the 2019 European Championships. Karle Howard was also there representing Team GB taking part in the cross Duathlon & finished 14th in his age group category. With Lowestoft Parkrun celebrating its 3rd Birthday on Saturday 27th, Lowestoft Road Runners were once again invited back to pace the event starting from 17 minutes & every minute from that till 34minutes. 81 personal bests were achieved that day and the event was praised by many via the parkrun event's Facebook page, thanking the club for excellent work and taking the time out to help the community with the ever going event. On Thursday the 23rd August Lowestoft road runners welcomed local running legend Paul Evans to deliver a half marathon training session to prepare runners for fast approaching Nicholsons Solicitors Lowestoft Half Marathon 2018. Paul was welcomed by 55 runners from various clubs, some experiences runners and some complete beginners who are looking at taking on the challenge of 13.1 miles along the East coast on the 7th October 2018. Paul took a speed session which included a warm up, followed by 2 half mile laps which had to be maintained at 10k running pace, followed by 2 laps at 5k running pace, then an all-out sprint to finish. Each lap had a two minute recovery time. Everyone at Nicholsons Solicitors & Lowestoft road runners want to thank Paul for his time and hope to welcome him back again soon. The club will be offering free sessions, every Thursday evening from now up until the race guiding runners around the course. With plenty of coaches and experienced runners you can pick up lots of hints and tips leading up to the big day. Lowestoft Road Runners did themselves proud this weekend by giving back to the community, starting bright and early at the Lowestoft parkrun by helping to 'pace' the event. A Lowestoft Road Runner each had a high visibility vest on, with a number which represented the time they aimed to finish the 5km route in, ranging from 19 minutes up to 35 minutes.. This gave participants a target and a volunteer to follow to help them achieve their goal. The event saw a record attendance of 380 runners and a massive 98 of those runners achieved personal bests with the help from the club. Event director Rob Fawcett said he heard nothing but praise from participants who couldn't thank the club enough for them helping to achieve times they have been chasing for a while. He looks forward to the club pacing the event again on the 27th October, Parkrun Lowestoft's 3rd Birthday. The following day saw 14 members descent into Dereham for the Great War centenary 5km road race. The race saw 7 members achieve personal bests for that distance. First home was Chris Haylock with a personal best of 17:45, who also picked up a trophy for his age category. Second home was Simon Cook in 17:48 closely followed by Tom Galley in 17:52 who also achieved a personal best. An early morning beckoned on Saturday 23rd June for 4 members of Lowestoft Road Runners for what was set to be a very long day. Aaron Shrimpton, Ian Chilley, Gary McDonald and Vanessa May ran the Norfolk 100km trail race. The race started at 7am with a nettle ridden route around Castle Acre, Norfolk, to join the Peddars Way heading North towards the coast. This part of the route was now familiar to them, but presented deep rutted ground, and sometimes heavy surrounding growth. A complete contrast to their Peddars Way ultra marathon in January when it was more like a mud bath. On reaching the coastal village of Holme-Next-The-Sea, the second checkpoint, was a welcome chance to refill drinks before turning eastwards onto the Norfolk Coast Path, which they would follow for the remainder of the race. At Thornham the coast path headed inland for a while, before going back towards the coast some time later at Titchwell. Weather was mostly warm and humid with little breeze so keeping a check on fluid intake was very important, so for Aaron and Gary a swift visit to the ice-cream van near Brancaster for ice lollies proved to be refreshing. The coast path saw the runners head through the coastal villages of Burnham Deepdale and Burnham Overy before tackling the dunes of Holkham and heading through the woodland to Wells-Next-the-Sea. Arrival in Wells was welcoming as after checking out the route in training the rest was now familiar ground and gave the reassuring knowledge that it was only 20 miles to go till the finish line. Knowing the route however had its pitfalls as it also meant they knew what was coming later on. After passing through the village of Cley all that was left to tackle in the last 13km was just over 4 miles of relentless shingle bank which continued to Weybourne and the hills into Sheringham including that of the watchtower and the last climb being over Beeston Bump before the finish at Beeston Hall School. For Aaron, Gary and Vanessa the completion of this race was completion of the Positive Steps Grand Slam and earned the three a grand slam memento of a specially engraved glass tankard. Ian will be completing this in October at the King's Forest 50k as he started his quest a race later than the others. Leading the club members home in 9th position was Aaron with a time of 12:02:25, next in 12th places was Gary in 12:11:36, Ian finished 16th in 12:32:33 and Vanessa finished 21st (7th lady) in 12:44:35. There were 51 finishers of 55 starters. On Friday the 4th May Lowestoft Road Runners met with their sponsor Nicholsons Solicitors for the first time to show them what the club are made of. Coach Shaun Lark led the session, alongside fellow coach Leigh Butcher. Leigh Butcher, Club Chairman, said “What better way to show our sponsor what we do and what their sponsorship supports. We are very proud of our club and it was lovely to welcome Nicholsons Solicitors to one of our sessions. We work very closely with Nicholsons Solicitors in the lead up to the Nicholsons Solicitors Lowestoft Half Marathon and it was nice to finally put some names to some faces. We look forward to now being able to cheer on #TeamNicholsons on the 7th October at Nicholsons Solicitors Lowestoft Half Marathon 2018”. The ‘mini-Olympics’ themed session went down really well, with a natural spark of friendly competition forming between the legal heads and the Lowestoft Road Runners. Such a fun and different way to introduce the local law firm to the running club which they proudly sponsor. Fun and games at the event. Wednesday the 25th April saw the first race of the Great Yarmouth Road Runners’ 5 mile series and it saw yet another massive turnout for the Lowestoft Road Runners. 39 members in total took part in the race. John Jervis was first male Lowestoft Road Runner over the finish line in a precise time of 30:00, 23rd position overall. Closely followed by Simon Cook 30:10 (26th) and Martin Farr 31:05 (38th). Katy Oldman obtained a personal best and first female Lowestoft Road Runner over the line in a time of 34:40 after completing the London Marathon just days before! She was followed by Tracy Prewer, first in her age category with a time of 36:13. Vanessa May (36:17,) and Vicki Grice (36:31,) pushed each other round the flat 5 mile course along Great Yarmouth seafront coming in 3rd and 4th Lady for #TeamLRR. Originally set for March, due to bad weather the Coltishall Mad March Hare 10km race was postponed to last Sunday. Although, still not ideal weather conditions, five Lowestoft Road Runners took on the windy course around the RAF base in Coltishall. May Wong was the first Lowestoft Road Runner home in an incredible 47:46 followed by Becky Lawler, a personal best of 49:10 and James Crisp 50:01. Wishing a speedy recovery to Debbie Lovegrove and John Drinkwater, who due to injury, were unfortunately unable to finish the race. As the temperatures hit a record 23.3C for Sunday's marathon, runners who had trained throughout the long and cold winter struggled to cope with the heat and sunshine. To make it more of a challenge, if any more were needed, this was the first week the runners have run without woolly hats and gloves for six months. It was to be a shock to their systems. The crowds, as ever, were wonderful as was the atmosphere of camaraderie and desire to mutually help and encourage. Our very own Bungay Marathon winner Paul Lyon led Lowestoft road runners home with an incredible time of 3:08:20. Katy Oldman was our first club lady back in 3:44:53 closely followed by Karen Archbold 3:46:03, Lisa Riley 3:56:37, Jonathan Meadows 3:58:05, Simon Bunting 4:27:15. Susan Perry deserves a special mention. She aggravated an existing injury, fracturing her heel, in a fall at seven miles .She struggled on, to complete the race in a nevertheless impressive time of 4.31.29 The heat was hard to cope with but the organisation of the event, the supporters, medics and St John's ambulance all did a wonderful job to cement this race's reputation as the world's best marathon. Closer to home Great Yarmouth held the East Coast Triathlon event which was held over Saturday evening & Sunday morning. Carl Prewer was the only male LRR athlete who took part in the Saturday evening race & Finished in 10th with a time of 48:23. Louise Bernasconi represented the ladies and completed it in a respectable 53:24. Sunday Mornings race saw Vicki Grice shine to victory & winning the female race in 51:06, Neil Bye finished 28th position in 52:41 with it being his first ever triathlon. Florence Ashdown was 63rd in 1:00:15 closely followed by Steph Strowger in 1:00:55. Team LRR dominated the Lowestoft 5 mile prom dash this weekend. Thirty five club members took part in the race. Chris Haylock was first home for the club finishing in 8th place with a time of 30:08 closely followed by Simon Cook in 9th finishing in 30:14 but it was Lowestoft ladies who really showed what the club is made of! Vanessa May, Becky Lawler & Rachel Plant picked up the winning team prize. Overall, a massive turn out for Team LRR and great results across the board. Six members also took on the tough City of Norwich Half marathon with 1887 runners in total. Aaron Mckoy finished in 37th position and come 3rd in his age category with an incredible time of 1:27:11. Next was Ian Marshall 1:45:29, May Wong 1:47:28, Rebecca Palmer 2:18:47, Suzy Grant 2:20:05 & Philip Laurier 2:38:40. Brighton marathon saw five members take on the course with four of them taking on 26.2 miles for the first time ever. Tom Galley was home first for the club with an incredible time of 3:16:27. Tom said “it wasn't without its difficulties and I had to dig in really deep for the last few miles.” Next saw the clubs married couple Shaun & Debra Kay finish with a time of 4:16:43 running and crossing the finish line together. Both new club members and first time racing for Lowestoft Road Runners was Lee Roth with 4:56:07 and James Clark at 6:16:00. Ian Chilley also obtained a new personal best of 1:47:39 at Boston Half marathon, the only Lowestoft Road Runner to take in this course, this year. Sunday 8th April saw Bungay Black Dog’s annual running festival which consisted of a half marathon, a full marathon and a 10km race. 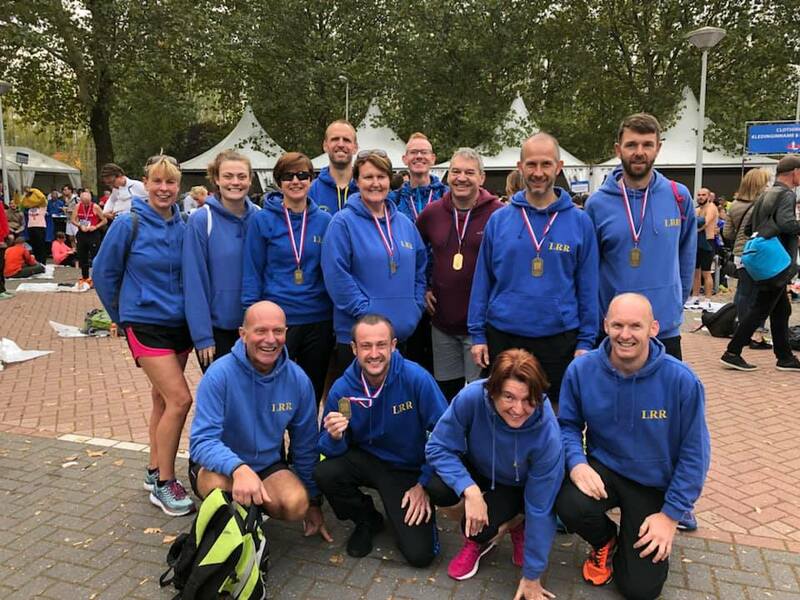 The weather may have been questionable but there was certainly nothing dull about the running results achieved by Lowestoft Road Runners this weekend. Lowestoft Road Runner’s Paul Lyon bought home the title this year coming 1st in the full Marathon with a smashing time of 2 hours 58 minutes and 9 seconds. It was not an easy win though, it come down to a sprint finish with just 3 seconds between Lyon and second place runner Jason Taylor. Other Team members in the race included, Matthew Sutton, Simon Cook, Gary McDonald, Aaron Shrimpton, Ian Chilley and Gina Warford. First Home for team LRR in the half Marathon was Martin Farr with a recorded chip time of 1 hour 28 minutes closely followed by Katy Oldman 3rd place for the woman with an outstanding 9-minute personal best, finishing in 1 hour 33 minutes and 26 seconds, other team members which ran include Lisa Smith, Leila Bye, Neil Bye, Stephen Bullen, Matthew Reynolds, Rachel Plant, Karen Evens and Mark Smith. With a great turn out In the fast paced 10k race and with ten of our members running our chairman Leigh Butcher was first in with a recorded time of 39:32 followed by Matthew Reynolds 47:52 and Florence Ashdown 52:09 other members to run this portion of the festival include David Smith, Emma Fountain, Su Wilson, Caroline Moore, Marie Wallace, Nicola Watson and David Graham. Matthew Reynolds was the only Lowestoft Road Runner to complete both the 10k and the half marathon (double doggy) on the same day. Overall, the festival attracted over 1100 entries in total, raising money for SPCC and the Beccles and Bungay community transport service. Lowestoft Road Runners also saw some great results from Diss Duathlon, it was many of our members first attempt at this kind of event. Great results from Carl Prewer, who come third in his age category. Mark Elflett, Steph Strowger and James Crisp. Meanwhile, across the border Lowestoft Road Runner’s couple, Vicki Grice (3 hours 52 minutes and 57 seconds) and Karle Howard (4 hours 1 minute and 48 seconds) both obtained person bests at a marathon in Milano! Whilst more commonly associated with rubber from racing cars, on 19th November Snetterton Race track welcomed the rubber from the soles of 775 runners for the Snetterton Half Marathon. A change from road running traffic was not an issue and with the weather being cool, calm and dry it made way for good racing conditions. The race started on the Senna straight and following an anti-clockwise (the opposite to motor racing) 3 lap route around the track with an extension over the bridge from the Agostini bend to make up each 7km lap before rejoining the track. The race finished in the pit lane. Of the runners were eight members of Lowestoft Road Runners (LRR). First to finish for LRR was Chris Haylock returning on good form after recent injury blights to finish in 20th place in 1:24:41. Followed by Simon Cook 24th in 1:25:13, Martin Farr 57th in 1:30:30, Aaron Shrimpton 91st in 1:33:41, Matthew Reynolds 144th in 1:38:22, Susan Perry 150th in 1:39:04, Ian Chilley 404th in 1:56:52 and Emma Garrard in 505th in 2:06:53. Simon Cook, Matthew Reynolds, Martin Farr, Emma Garrard, Susan Perry, Aaron Shrimpton and Ian Chilley. On the same day three members of LRR travelled across the county to Hadleigh for their Hadleigh 5 five mile race. Weather conditions also proved favourable being cold but sunny for the race around what was described as a challenging and hilly course. Regardless of the challenges the course presented there were successes all around for all members. Of the 133 finishers Karen Archbold finished in 35:12 finishing 16th overall but 3rd lady. This was also enough for Karen to achieve her club platinum standard. Simon Bunting was 21st finisher in 38:38, winning his age group. David Graham, running in only his second ever road race, finished 22nd in 38:57 which is another qualifying time towards his bronze club standard after only joining the club earlier this year. David Graham, Karen Archbold and Simon Bunting at Hadleigh 5 mile race. Sunday 5th November was obviously a date to remember for Lowestoft Road Runners with 40 members, consisting of 15 ladies and 25 men, heading down the A12 to Framlingham Castle for the opening fixture of the Suffolk Winter Cross Country League. For many this was the first time running Cross Country and their first time running in club colours too. For the Ladies: Colleen Nicole Mukuya (first lady) 41st, Karen Archbold 212th, Tracy Prewer 222nd, Nadine Hesseltine 231st, Susan Perry 264th, Jo Bisset-Smith 291st, Amanda Smith 307th, Cat Fletcher 332nd, Debra Kay 343rd, Marie Ayers 373rd, Vanessa May 383rd, Gina Warford 464th, Claire Collier 486th, Jo Clark 488th, Su Wilson 493rd. In the men's contingent: Carl Prewer 16th (first in his age group), Paul Lyon 36th, Arron McKoy 48th, Tom Galley 61st, Martin Farr 73rd, Simon Cook 74th, Lee Gooderham 99th, Robert Cheverton 101st (first in his age group), Jonathan Payman 103rd, Bernard Mukuya 106th, Aaron Shrimpton 129th, Gary McDonald 142nd, Neil Wood 163rd, Matthew Reynolds 204th, Shaun Kay 218th, Tom Spalding 226th, Ian Marshall 227th, Allan Ing 237th, Ian Chilley 252nd, Mark Elflett 267th, Philip Ayers 270th, Simon Bunting 283rd, James Crisp 297th, David Graham 314th. These results see Lowestoft Road Runners starting the league in a strong position with the team standings as follows: Mixed A team 6th, mixed B 4th and the mixed C team also currently standing 4th. The women’s A, B and C teams the standings are 4th, 2nd and 2nd respectively and the men’s 9th, 7th and 5th. Sadly Shaun Crowley had to pull out of the event due to an existing injury causing difficulties. The club are now looking towards the next fixture on 3rd December in Woodbridge and hoping for an equally strong, if not stronger attendance. October proved to be a month of marathon achievements for members of Lowestoft Road Runners. On the 15th two members travelled out of the region, both for Marathon firsts. Vanessa May travelled to Amsterdam for the TCS Amsterdam Marathon for her very first marathon. She ran a very consistent race, with her split times for the first and second half being almost identical. She finished in 5730th place of 11,442 finishers with a time of 4:01:02. On the same day Matthew Reynolds was running at the inaugural Birmingham International Marathon. He finished in 1547th place of 5217 with a time of 4:03:44. Taking to the trails, also completing her first marathon Amanda Smith finished the Endurance Life Suffolk Coastal Marathon around Dunwich Heath and surrounding areas finishing in 41st of 87 finishers in 4:45:56. The following weekend, 22nd October, saw Susan Perry finishing Chelmsford marathon in a blistering 3:44:00; 160th place of 572. October 28th saw Gary McDonald taking on Snowdonia Marathon for the third time and tackled typically Welsh hills and weather beating his previous best time on this race by 3:59 with 4:05:40 in 622nd position of 2216 finishers. Continuing with the achievements Chris Haylock lead the club home at the Holt 10k in 10th position overall, winning his age group and getting a new personal best time of 37:19. Matthew Reynolds was next home for the Road Runners in 74th place with a time of 44:06 with John Drinkwater completing the club field finishing in a strong 56:01, 239th place of 361 finishers. Left to Right Vanessa May, Chris Haylock, Gary McDonald, Matthew Reynolds, Amanda Smith, Susan Perry. In a phenomenal finish to what was a strong August for Lowestoft Road Runners Chris Haylock ran the Reepham 10k on the 27th August finishing 5th overall in time of 38:14. 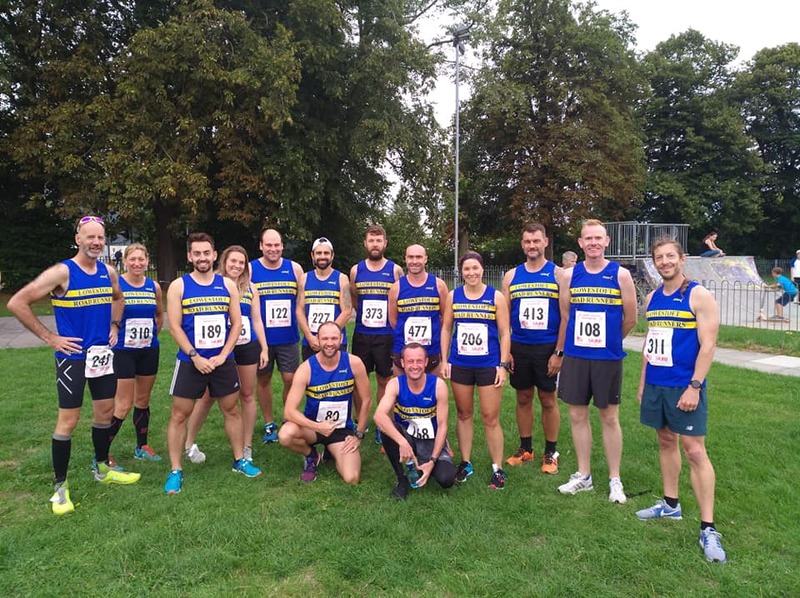 Three members of Lowestoft Road Runners also partook in Bedford Half Marathon which for Aaron Smart and James Crisp was their first over the distance. They finished in respective times of 1:57:58 and 1:58:02. Lee Gooderham also continued his personal bests streak by finishing in 1:29:26. Also running a half marathon was Jo Clark who ran the Wissey Half Marathon and finished in 2:36:53 even though she struggled for the last 5km. On September the 9th the triathlon action continues with Lowestoft Road Runners members as 4 club members take on the Challenge Almere Ironman in Holland. More on that in the next report. August is proving to be a month of personal bests for the team at Lowestoft Road Runners. 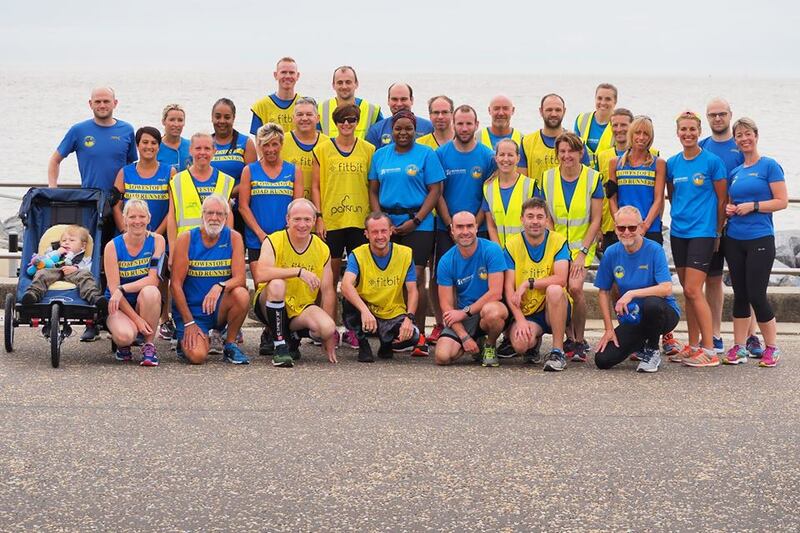 On Sunday 13th August 9 of Lowestoft Road Runners lined up among 308 to take on the Great Yarmouth Half Marathon with 7 members recording new personal bests. The route, starting at Ormiston Venture Academy follows country roads out to Lound before passing through the grounds of Somerleyton Hall before completing a loop back to Lound to follow the route back to the start/finish. On Sunday 6th August 11 members of Lowestoft Road Runners lined up among a field of 4737 runners for the third Run Norwich 10k event. Last night saw Lowestoft Road Runner host their Club Hanidcap on the Lowestoft Parkrun course. Four members of Lowestoft Road Runners took part in the Virgin London Marathon on Sunday 23rd April, one of the Abbott World Majors and for many very much a bucket list event. On 26th March fourteen members of Lowestoft Road Runners made the long trek to the final fixture of the Suffolk winter cross country league of the season, the first time at this location. The course was approximately 5 miles long.